This Easter has been based on a budget in our household. Ben and I have not bought Easter Eggs for one another and we have not purchased anything for other family members. Easter has been based on Maxwell and with that in mind we had a budget of £5 to keep him happy. I think people often forget the true meaning of Easter and I do think people go overboard when it comes to buying Easter eggs and other items. Easter to me, means spending time with my family. It mean's seeing Maxwell's face light up and this would happen if we spent £1 or £25 on him. This Easter Maxwell will be getting a Easter hunt. He will also have a visit from Mr Bunny who has left him instructions on how to complete his Easter Hunt. Mr Bunny was created by me. I already had materials to make Mr Bunny so he cost me 0 pence. He took me around just a hour to make. 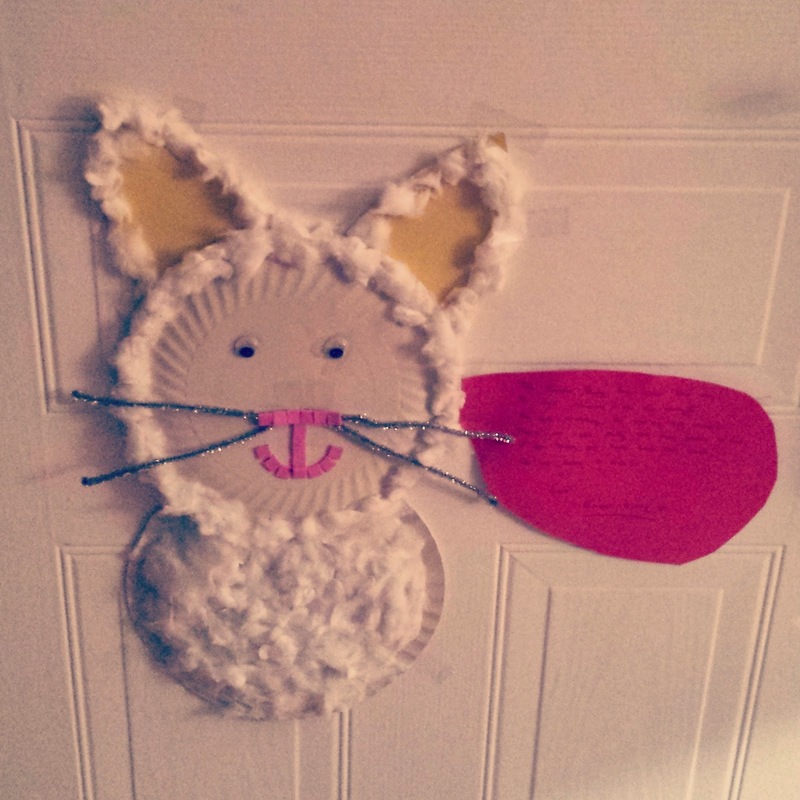 Mr Bunny is simply made out of paper plates, cotton wall, paper and pipe cleaners. I also used a lot of glue. I think Mr Bunny is a simple idea but one which Maxwell will love come morning. I have made a perfect little rhyme up to accompany Mr Bunny and I am hoping it will encourage Maxwell to behave this Easter holiday. Maxwell's Easter hunt is made up from reduced items or items which I managed to blag for free. Maxwell's Easter Egg hunt consists of 2 small chocolate Nestle Easter Eggs which I got for 50p with coupons, I managed to get 2 packs of mini kinder eggs which were free with coupons, I also got a big bag of Haribo which is made up of multi packs - I purchased this from the £1 store. Along with this I also managed to pick Maxwell up some Mr tumble books which were reduced to just £1.25, he also has a Easter colouring book which was reduced to 30p, a pack of crayons which were free from a competition win and a craft box which I managed to pick up again for £1.25. Finally we purchased Maxwell a felt basket form the £1 store so he is able to collect his Easter gifts with ease, this is a item which we will use again in the future. I know Maxwell will be more than happy with the items we got him this Easter and I am extremely excited to watch him go on his hunt tomorrow. I am also extremely proud that we did not spend a lot of money on him. The money which we saved will go towards Swimming lessons for him. Easter does not have to be a expensive event! Memories last longer than material objects. Totally agree with this, the ludicrous amount spent and pictures on facebook of almost a competitive nature, huge piles of eggs, designer baskets, really undermines the meaning of the day. Lovely to see a meaningful bunny made with love. I bet Maxwell loves tomorrow. I've kept to a budget too. I've already seen a photo of someone who has bought their 2 and 4 year old scooters and other toys amongst their eggs! well said! It's getting out of hand now, like halloween and christmas.... I agree with Jo Bryan about the competitive nature. We used the samer plastic eggs that we use every year and filled them with cheap chocolate eggs and things from Home Bargains.... it should be about fun!